Sometimes a certain song becomes indelibly attached to a time/place/person. Listening to The Buoys with “Give up your guns” and I’m propelled back to the summer of 1972 (for 4.05 minutes anyway). The outro/instrumental is the best part. Actually a lot of of the songs on this chart stick in my mind. Do you remember “We’re on our way” by Chris Hodge ?? I took my little russian portable radio (with its cute leather case) everywhere I went back then. PS: The Buoys only other hit was “Timothy” which made the US charts even though it was all about cannibalism !! PPS: If anyone should want to look at other Dutch Pop charts from the early 1970s you will find them right here. The nerve centre of the whole operation is two turntables on a bench in a room (cabin actually…) with scruffy pegboard walls. Well what did you expect ?? The analogue early 1970s is a world away from the computer-programmed radio stations of today. No computer screens to look at. Just a board reminding them of the station id. Here is a short extract from Radio Northsea International one evening in late August 1974. Its lo-fi because I recorded it on my primitive equipment a few days before the offshore pirate radio station closed down for good. The DJ sitting on the chair in the photo and playing the records is Robin Banks (Adcroft ?). RNI first began official broadcasts in early 1970 and for reasons that are still unclear ceased transmissions in September of that year after an eventful 9 months. 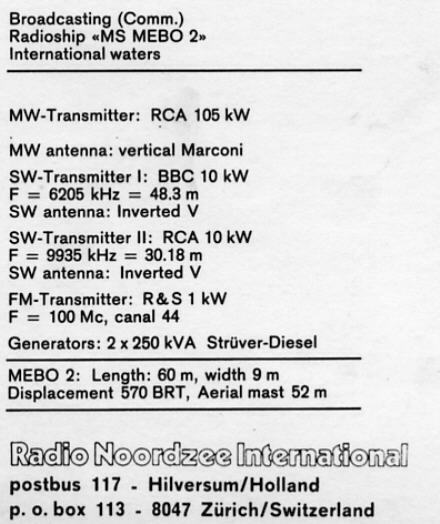 They would return however in early 1971 and continue to broadcast pop music from the Mebo 2 anchored in the North Sea (obviously) to a “young Europe” on MW/VHF/SW until August 1974. I won’t bore you with the details. There are many other places on the Interweb already covering the details well. I must have purchased this 12 page booklet detailing RNI’s “history” to date in late 1970 or early 1971. Most likely it would have been via a classified advert in the UK pop music newspaper “Disc and Music Echo”. That was where I’d find info to send off for “Newsletters” about Offshore Pirate Radio news of the time. The best of those publications was “Monitor”. This began as a few foolscap sheets of coloured paper stapled together and ended up as an A5 booklet printed roughly 4 times a year containing fantastically detailed accounts of the comings and goings of the DJs on Radio Caroline/Veronica/Mi Amigo/Atlantis etc throughout the 1970s and 1980s. This magazine was published by the late Buster Pearson using a remarkably enlightened (LA….Loving Awareness) approach. The magazine had no fixed price!!! Buster asked you just to send what you could afford!!!!. When I was a penniless student I just sent him a few shillings per issue. Once I was in gainful employment I tried to send a few £££s per issue. Buster only printed an issue once he had collected enough funds from the previous issue to finance the next one. This next issue would be posted out to all the people on his mailing list and he would just trust that they would send him money to pay for it. This system operated for many many years with Buster never soliciting any money up front. I don’t think you’ll find too many people using that business model today. But of course Buster wasn’t doing it for the money…just his love of the Pirate Radio scene of those times. 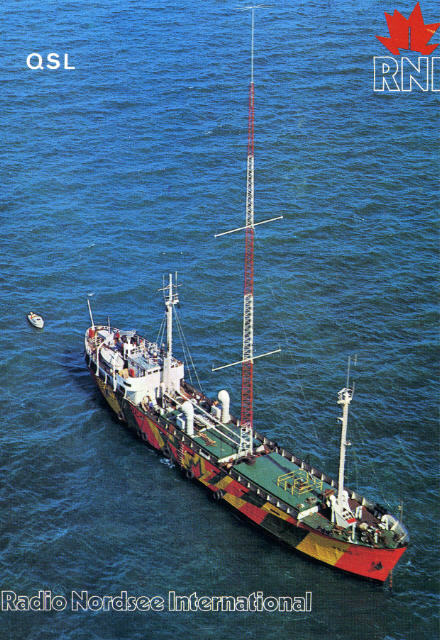 Roland C. “Buster” Pearson (1928-1985) was honoured with this documentary on Radio Caroline. (Evening reception was always variable on Medium Wave and my radio/cassette recorder basic but I thought the subject matter makes it interesting). 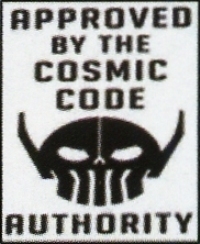 Also see here. And here for links to more Offshore Radio stuff. I must dig out a few copies of “Monitor” but for now click below for a pdf file of the Radio Nordsee International Booklet from 1970 written by Russel Carey with help from Fred Grilge,Eric Clapton,Emiline Crungebucket and many more.